The Kirklees Local Plan is progressing. The initial consultation - held over the Christmas period in 2015 - generated over 200 objections to the proposed quarry designated as mineral extraction site ME1965. Kirklees has ignored all those objections. ME1965a is still designated for mineral extraction on the local plan. Though this potential site is adjacent to the current Appleton Quarry, it's on the other side of the ridge and should be regarded as a completely new quarry NOT an extension to the current Appleton Quarry at the Sovereign. Site ME1965a is a 24+ hectare (66 acre) site which includes all the land between Cumberworth Lane, Dearne Dike Road, up to Rusby Wood Reservoir, and down to Park Head. i.e. the parcel of greenbelt land that runs from Five Lane Ends all the way down to Park Head Farm. It comes within 100 metres of the houses on Park Head and is only 5 metres from the family homes at Dearne Grange. Once site ME1965a is accepted as part of the local plan it will make it easy for Appletons to apply for planning permission and what is farmland will quickly become wasteland. As you can see from the map below, the new mineral extraction area (quarry) is far too close to many houses, and the noise, blasting/pecking, dust, heavy traffic, and high visual impact with the loss of a treasured greenbelt landscape will affect the whole village, including the school. We need to act now to stop the proposed plan becoming a reality. We believe that there are serious flaws in the Kirklees local plan. The choice of this site for mineral extraction goes against several guidelines in both the National Planning Policy Framework and the local guidelines (PLP36). We are fighting this plan on behalf of a village which is on the very edge of Kirklees, and is given no consideration by the council. On a local level Marshalls who operate the current Appleton Quarry have proved themselves to be 'bad neighbours' (in the words of one councillor). According to residents who are currently close to the existing quarry, they have contravened agreements to limit noise and traffic to specific hours and operated machinery through the night. This is disturbing to think that this company will be working so close to houses in Birdsedge, but in and of itself this is not legitimate grounds for objection. We can only object on legitimate planning grounds. There may be things that householders are worried about (such as reduced house prices) but these are not legitimate grounds for objection. See How to Object for a list of legitimate grounds for objection. Though it looks as though it could be contiguous, the current Appleton Quarry is separated from the proposed site ME1965 by a ridge. None of the existing quarries can be seen from Birdsedge Village because of the topography of the landscape. Because of the topography the proposed site is ABOVE all the surrounding houses to the east and south of the quarry, householders will be looking up into the workings. The prevailing winds will carry dust and noise. 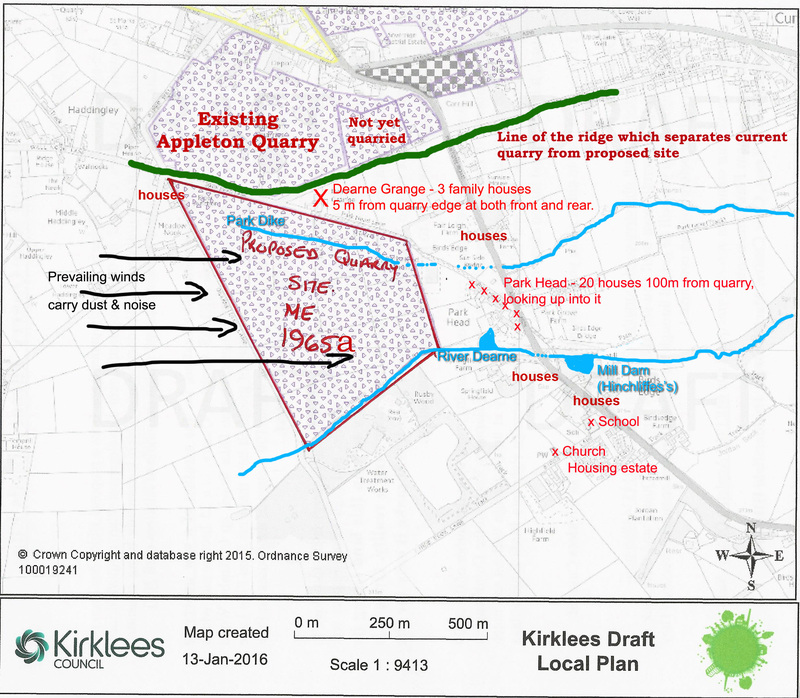 Also note that the quarry cuts off the watercourse of Park Dike completely and goes right down to the headwaters of the River Dearne. This could be an ecological disaster - and a commerical one as Hinchliffe's Mills in Birdsedge and Denby Dale use water from their three dams on the Dearne for industrial textile provcesses. Hinchliffe's Mills employ 350 local people. Click here for how to object.